For college football fans, the 2009 BCS National Championship Game was loaded with intrigue and fascinating matchups. There was the clash of two powerhouse programs–Florida and Oklahoma–and a faceoff between two of the sport’s most accomplished coaches–Urban Meyer and Bob Stoops. On the field, it was the battle between quarterbacks Tim Tebow and Sam Bradford that had captured the national spotlight. Tebow, the 2007 Heisman Trophy winner, was noted for his unique ability to run and pass the ball effectively while Bradford, the newly crowned 2008 Heisman Trophy winner, preferred a more traditional passing style. The game was expected to be a high-scoring affair, especially considering that the Sooners had already set an NCAA record for most points scored in a season. But sloppy play and defensive grit saw both teams struggle for consistency. 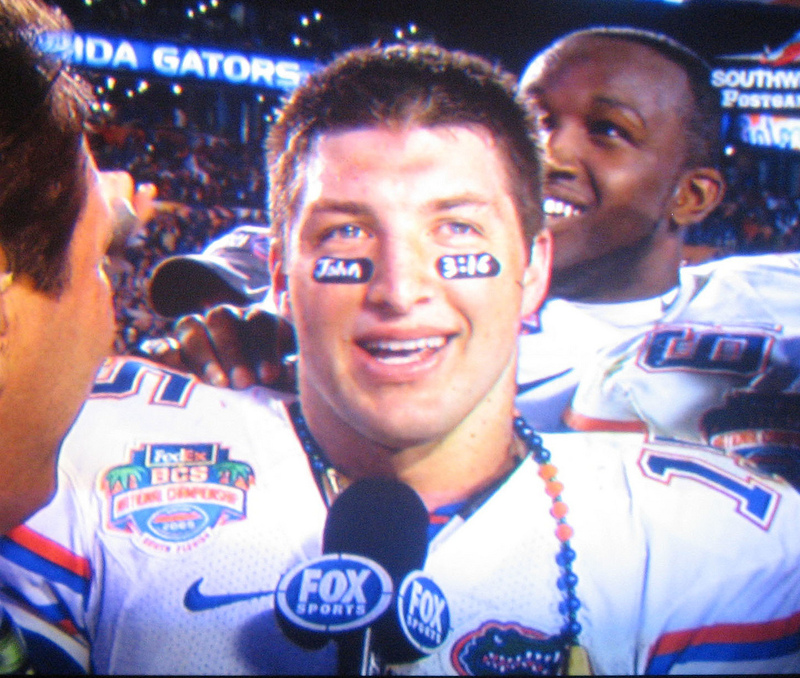 Ultimately, Tebow and running back Percy Harvin gave the Gators just enough of an advantage to claim the 24-14 victory and the coveted BCS title. Ironically, football wasn’t the only thing that captured the 26.8 million viewers’ attention. Many fans took notice of the eye blacks that Tebow donned during the game. Under his right eye was the word “John.” Under his left eye was the number “3:16.” Curiosity then fueled an incredible phenomenon that resulted in 94 million Internet searches. The following July at the Southeastern Conference media day, Tebow was asked about the buzz he had created. Since then, Tebow has remained one of the most popular sports figures in the United States. Although his NFL career was short-lived, he has continued to embrace his influential role as a speaker, author, broadcaster, and, most recently, as an aspiring professional baseball player. A year following Florida’s championship victory, the NCAA banned messages on eye blacks. The new statute, which quickly became known as “the Tim Tebow rule,” may have put an end to biblical references on the field of play, but not before the iconic athlete was able to make an enormous impact on popular culture. Dear Lord, thank You for those that stand up for You. We pray for strength for each one today. We pray that their testimony for You will continue to reach those in need. In the Name of Jesus, Amen.